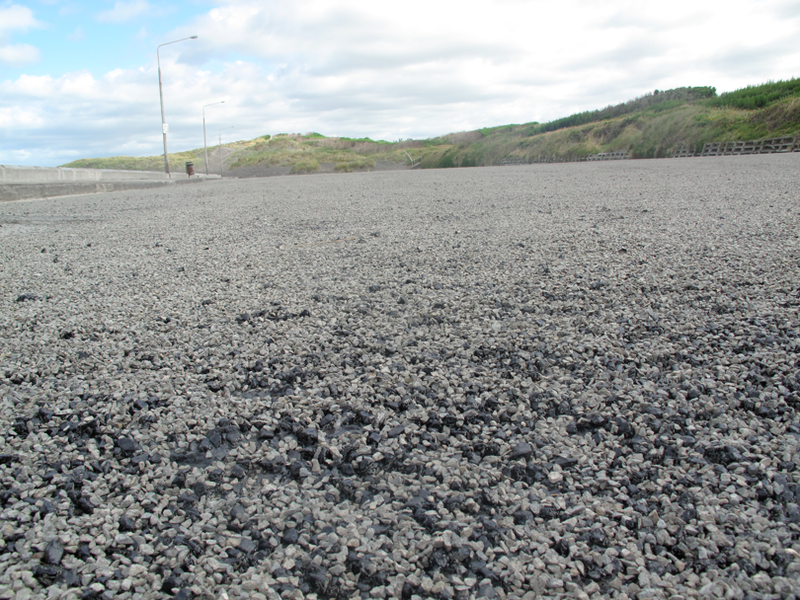 When I first wrote in October about what appeared to be the needless waste of rates “grooming” Castlecliff Beach it was in response to a comical situation: moving sand to windward with heavy equipment only to have it blown back into place within weeks. Then it happened again and again. 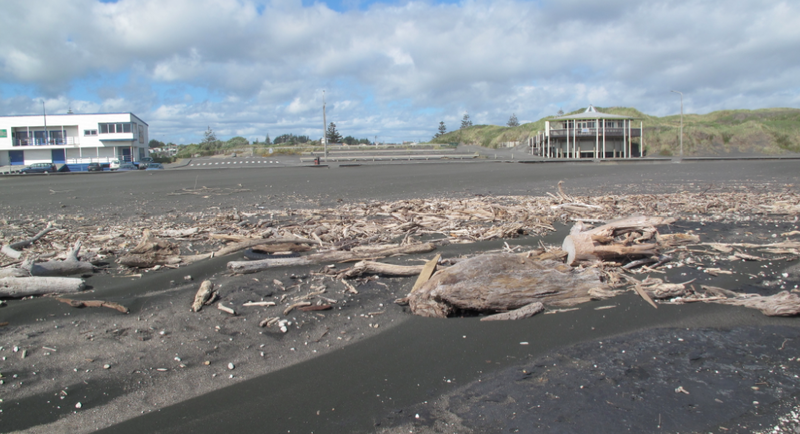 Weeks after a second massive effort pushing hundreds of tons of sand to windward, it was all back in place, and an excavator was moving it a third time while damaging the car park in the process. Eco-design has shown millions of times that working with nature is almost always cheaper in the long run. With this in mind, my suggestion was to take an eco-design approach to downsize the massive and underused car parks, which would save us all money and release less pollution through diesel fumes. I used the phrase ‘managed retreat’ because I had heard it used in reference to parts of the flood zone, and that it suits what would probably be a carefully considered, staged programme of right-sizing and retreat. What I saw as a common sense win-win situation has made me the target of a few individuals who appear desperate to keep the beach as it is. I think we’d all admit that change can seem difficult, and these people are probably afraid of changes to our beach so they lash out at anyone suggesting new ideas. I can assure them that my vision is for a better beach attracting more visitors at less expense. Living in a democracy, we all have the right to express our opinions on how our rates are spent. Elected officials choose to listen or not. In key ways, the context of Castlecliff Beach is similar to the context of our villa when we bought it: big, draughty, expensive to maintain. As such, we can use the beach as a thought exercise in eco-thrifty renovation. Form follows function: Although the area groomed appears larger than the infield at Cook’s Gardens, well over 90% of beach goers congregate only around the swimming area, which is usually about the size of a church hall. 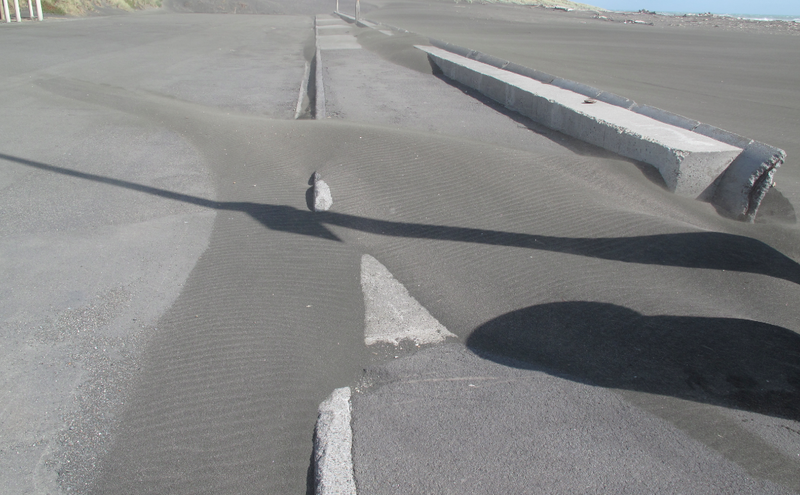 As such, why spend thousands of dollars grooming a large area of black sand into the Gobi Desert when the swimming area looks like Omaha Beach on D-Day? In terms of customer service, this arrangement falls apart: the dollars are not spent on what beach goers actually use. 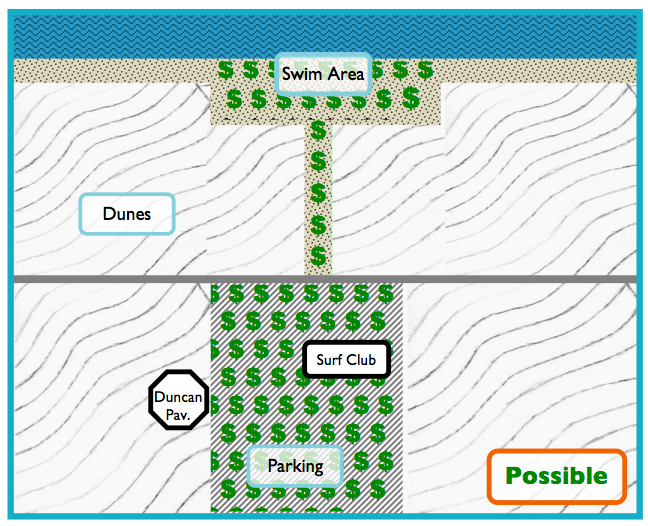 Right-Sizing: Along those lines, the parking areas at the beach are oversized and underused. It reminds me of a birthday party I once attended where the host prepared massive amounts of food and drink and almost nobody came. I left feeling sad. Again, comically (why does this term keep reappearing?!?) 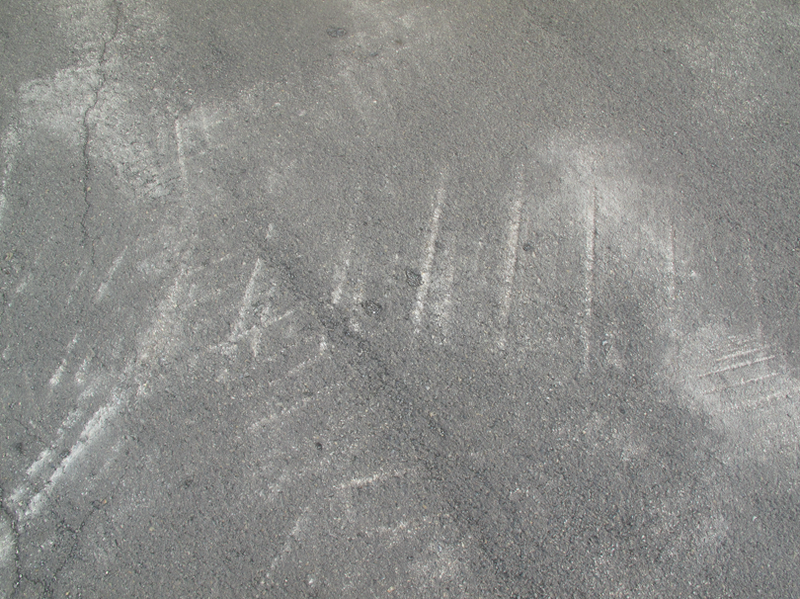 Council recently spent thousands of dollars resurfacing the least used of six distinct parking areas. I liken it to having your least worn of six suits dry-cleaned: fine if you have the money, but probably not if you’re on a budget. As the first diagram shows, most money is being spent on places where no one goes, creating the look of big, empty, uninviting expanse. I suspect our mayor, who has an awesome stall at the River Traders Market, will tell you that to attract people, the front of a stall must appear full of goods – giving a look of abundance, not scarcity. By right-sizing the car parks and beach, we can have a more inviting, less costly venue for free recreation. 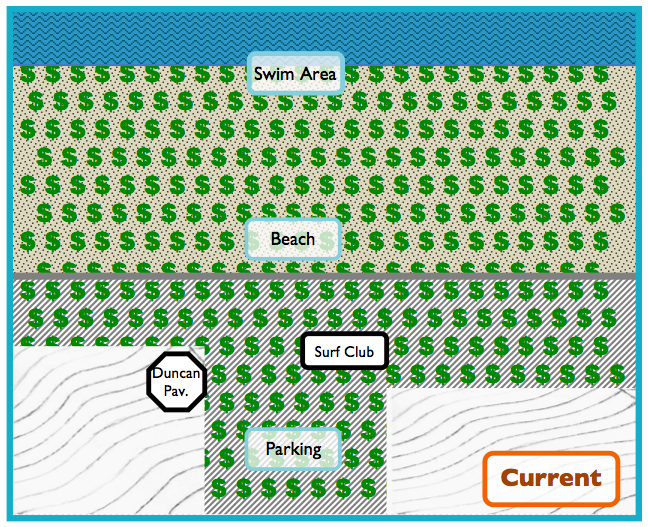 The second diagram shows what a beach might look like when money is spent where people go instead of where they don’t go. I will leave the next stage of retreat to the experts, some of whom may even live in our community. The Bottom Line: We are facing a situation where more frequent extreme weather events are pushing more sand around at the same time we have a large debt, and an inequitable and unsustainable rates structure. The practice of beach grooming will end one day. The question is: Do we continue to throw good money after bad, or do we invest in a more sustainable re-design that will save money while working with nature?